David Cohen is the founder and CEO of Techstars, a mentorship-driven startup accelerator, and Brad Feld has been an early stage investor for over twenty-five years. Both authors are innate entrepreneurs and authentically love entrepreneurs. 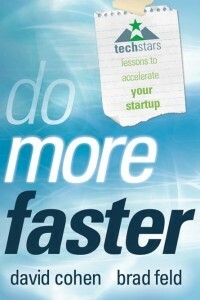 So Do more faster is not simply a platform to create speaking-opportunities, but the sincere expression of their desire to guide people through their journey. In this book, they do not steal the limelight away from entrepreneurs; while authoring a number of passages themselves, they also bring together a wide variety of contributors – and they do it to make sure that entrepreneurs will reap the benefits of key lessons learned by peers. This book is a must read. Even though it’s always difficult to measure how advice can really “accelerate a startup,” it’s certain that there are ways to make sure not to waste time. The art of building a startup is analyzed through seven themes, and these are divided into key related topics. 1- Idea and vision: You start with an idea that, after prototypes and multiple iterations, might end up being quite different from what you anticipated in the first place. For your own good, be able to adapt (because no matter how much you fancy yourself as a game-changer and disruption-bearer, you have to solve a real problem for real people – see an earlier post I wrote about windmills with wigs). So beware of the “next big thing” and keep away from what David Cohen calls the “everythingitis:” offer something that people want, and if you see that things won’t pan out no matter what, close the show earlier rather than later, elegantly. 2- People: However romantic the idea of venturing out as a solo pioneer, put your ego aside, and look for co-founders – while pre-empting the disastrous impact of possible future disagreements with a prenup. Also, no matter how skilled you have become at hiding your personal flaws and insecurities, make it a principle to hire people who are better than you. Given that you are not infallible, learn to fire quickly (“Two strikes and you are out,” Brad says), but don’t turn into a tyrant: a company is a great team of complementary talents, as well as a managed network of relevant customers and evangelists. 3- Execution: That’s the nervous system of any startup and I am glad to see this very early in the book. If you are not an “execution machine,” you are just a dreamer and forget about your entrepreneurship dreams. You have to do everything faster than an established company and fall back on you feet as quickly as a cat. Trust your guts, be decisive, learn that a one-of-a-kind customer doesn’t create a market, and scale your business through replicability. You may find out that the company will not thrive. So fold it sooner than later. Learning through failures is a great reassuring American spiel (provided than you don’t start to believe that it can be a way of life). 4- Product: Another great section, often tied to section 1. Despite efficient filters (Techstars accepts just 10 of the more than 600 startups that apply), “we find at least one-third of those startups are attempting to build a product that they want, or that no one wants, instead of what the market wants” the authors say. Don’t wait until you are proud of your own product, focus on what matters, obsess over the right metrics, and never forget that customers are kings. 5- Fundraising: Most companies come to Techstars with the goal of raising money. Well, should it be really your goal? Sure, you will learn more about the art of raising money, but also find out that you may not have to. Beware of angel investors who aren’t investors, find the right ones who care about the right things (in the end: it’s results! ), and realize that bootstrapping can be a very efficient way to right-size your business. 6- Legal and Structure: This is not fancy, but key: form the company early and choose the right company structure – and default to Delaware. And even (some) lawyers can tell you that “lawyers don’t have to be expensive,” which doesn’t mean that you should select your brother in law to stay on the cheap side. Cheap is cheap – and sometimes very expensive. 7- Work-Life Balance: Yes, you will work around the clock. But at some point, you need to recharge your batteries. Various ways to do that, even though it’s hard to get your passion out of your mind. Techstars is a great mentor-driven accelerator, and has become a meaningful part of the ecosystem in Boulder, Boston, or Seattle and will soon in New York City. This is a replicable model, and the great thing about the whole initiative is that David Cohen has been very open about the results. Entrepreneurs, read Do more faster + Guy Kawasaki’s The art of the Start and Reality Check as well as Steve Blank’s The Four Steps to the Epiphany, and you are sure of at least one thing: starting with your head on your shoulders. Good luck! Marylene – thanks for the awesome and thorough review!